Journey (le voyage) – the act of traveling from one place to another. 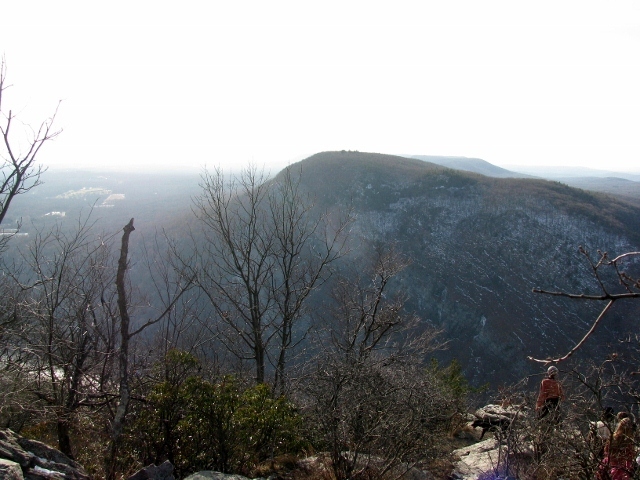 This photo was taken on a one-day journey, a hike on the Appalachian Trail. 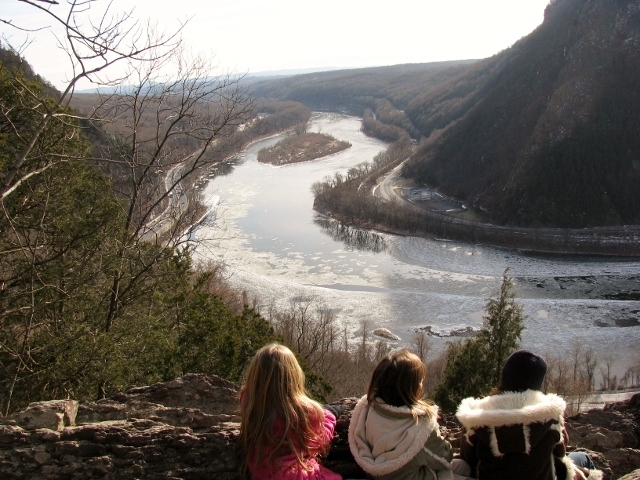 But to me, it also tells the tale of a journey of millions of years – the journey of the Delaware River carving its way through a mountain, to form the Delaware Water Gap. The left side of the picture, where we were hiking, is Mt. 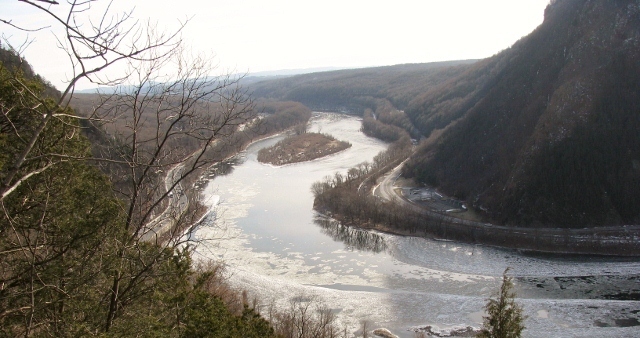 Tammany in New Jersey, and on the right side, across the Delaware River, is Mt. Minsi in Pennsylvania. 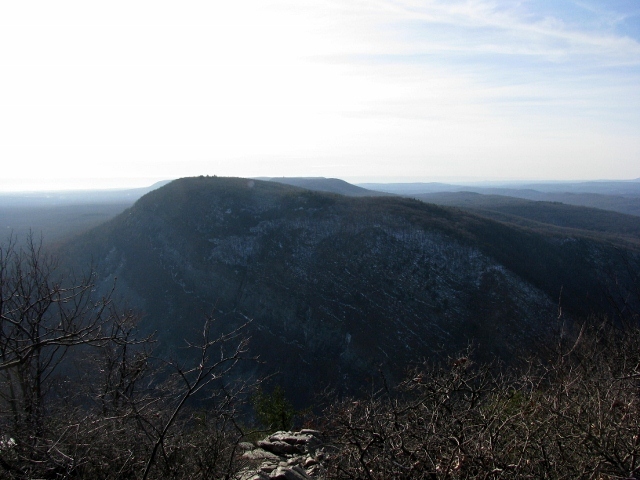 According to the Delaware Water Gap Recreation website, the Gap began forming 420 million years ago. Then, only a few million years ago, water began to work its way through the mountain, eventually becoming a stream, then a river on its journey to the sea, carving out the Gap which now exists between the two mountains. It measures about 1 mile wide and 1,200 feet deep. For a more details on how the Gap formed, click here. Here is the same photo with the kids cropped out, in case you’d rather just view the scenery and not the back of their heads. And a few more pictures from that journey. Sunday afternoon is a nice day to take a walk. Or, go on a journey. Get going – take a hike! Allez-y – prenez une randonnée! I didn’t know that “Pennsyltucky” was an official word! Great shot of the kids overlooking the river. Well, I don’t think you’ll find Pennsyltucky in Merriam-Webster, but I believe it appears in the Urban Dictionary. Thank you for visiting and for your comment on the photo. Merci! Loved “Out of Africa.” I haven’t watched that movie in many years. It’s on my list of movies I’d like to watch again soon. I’ve found that sometimes, over the years, my perspective changes and a movie that I watched 20 years ago and thought was fabulous, now does not seem so wonderful. But I don’t think that would be the case with this one. Oops. I’m way off topic. 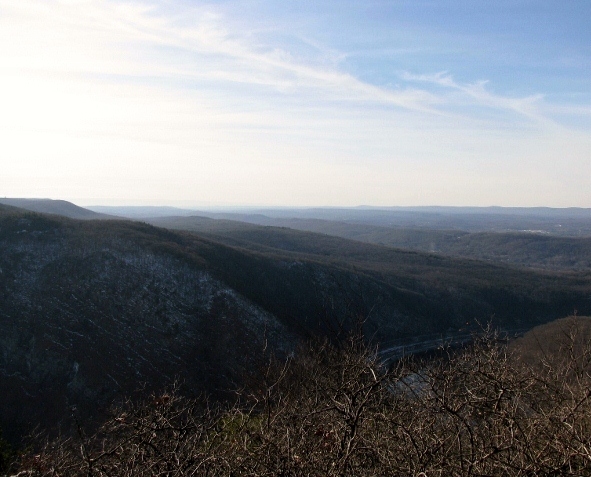 Focusing… Our mountains, the Kittatiny Ridge, are about 1/5 the size of the Smoky Mountains. The Smoky Mountains are breathtaking during the day! We had an adventure there on the Blue Ridge Parkway, traveling at night, in the fog. I may have to post that story sometime. Thanks again and enjoy your day. Thank you. So glad you liked it. Thanks for stopping by. Merci! Thank you. Someone once told me that photographs were always more interesting if you included people. I tend to agree. I’m glad you liked the photo and thanks for visiting my blog. Merci! Thanks for the link. Merci! I like the interpreation of the river on it’s journey over the centuries. Nice take. Thank you for taking the time to read the story. 420 million years? I have difficulty trying to comprehend 420 years. Life is so short. Glad you liked it and thank you for stopping by. Merci! Thank you for the pingback. Merci! Glad you liked it. Thanks for the link. Merci!